Fourth Row Center: Film Writings by Jason Bailey: In Theaters: "My Son, My Son, What Have Ye Done"
"So, this is odd," reads one of my early notes from my viewing of My Son, My Son, What Have Ye Done, though I’m not sure what the hell I was expecting—it’s directed by Werner Herzog and executive-produced by David Lynch, after all, so the fact that their collaboration bore a peculiar offspring certainly shouldn’t come as a surprise. What is shocking about the enterprise is how borderline-unwatchable the whole thing is. It doesn’t play like the work of the men who made Fitzcarraldo and Stroszek, Blue Velvet and Mulholland Dr.; it feels instead like a poorly-executed copycat film by an untalented film school student. It’s strange, but in a self-conscious and frankly self-indulgent way. The opening titles proclaim the picture to be “inspired by a true story,” and I guess I’ll take their word for it. We’re first introduced to a pair of San Diego homicide detectives (played by Willem Dafoe and Michael Peña) out for a drive and a chat; they engage in dull pleasantries before getting a radio call to an 1144. “What’s an 1144?” Peña asks, which certainly seems like something a police detective would, ya know, be aware of. They arrive to find Mrs. McCullum (Grace Zabriskie) on her neighbor’s floor, dead from a sword-stab wound. The neighbors tell them that her son Brad (Michael Shannon) did the deed; he’s across the street in their home, and he’s taken two hostages. 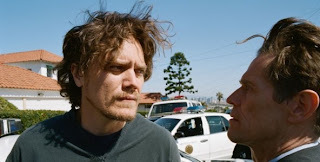 Brad’s fiancée Ingrid (Chloë Sevigny) arrives, and tells Detective Havenhurst (Dafoe) about Brad; her flashbacks are intercut with the not-terribly-suspenseful standoff. In many ways, My Son, My Son, What Have Ye Done manages to combine and highlight the worst elements of both Lynch and Herzog’s styles. Herzog’s direction is full of deliberately odd choices, stunt moments and sequences that feel like he forgot to turn the camera off. Multiple scenes end with strangely tableauxed compositions, held in thick silences that seem to last an eternity. Individual shots seem at odds at each other within scenes; the cuts are jarring, and the film lurches unsteadily from one peculiar moment to the next. It’s hard to tell if the actors got much help. Shannon, a reliably good actor (he was fantastic in Friedkin’s Bug and Oscar-nominated for his strange but memorable turn in last year’s Reservation Road) turns in a prickly, odd performance that’s bewildering but entirely appropriate to the material (for whatever that’s worth). Dafoe is oddly presentational and not terribly convincing—his line readings are mannered and he handles his gun and his note pad as if he’s never used them before. Zabriskie, that terrifying woman at the beginning of Inland Empire, basically gives the same mannered, tic-filled performance here, but for an entire film (and less is more with that kind of thing). Poor Sevigny is stuck playing the only person who seems remotely connected to the human race (most of these scenes play like they’re being acted out by aliens), so, in playing her character as a real person, she’s either giving the best performance in the movie, or the worst one. My Son, My Son, What Have Ye Done is not incompetently made, which is part of what’s so frustrating about it; it hits theaters around the same time as Herzog’s Bad Lieutenant: Port of Call New Orleans (indeed, it shares many members of that film’s supporting cast), which confirms that the director can make a film that’s simultaneously batshit crazy and narratively compelling, when he puts his mind to it. I’m sure that arguments can be made about what he’s trying to accomplish here, how he’s replicating the theatrical style of the Greek tragedies that it broadly alludes to, etc. Well, you can intellectualize the damned thing all you like—it doesn’t play. It’s weird solely for the sake of being weird, without engaging or entertaining its presumptive audience. There are talented people involved, but it couldn’t matter less; My Son, My Son, What Have Ye Done is just impossible. "My Son, My Son, What Have Ye Done" opens at the IFC Center in New York on Friday, December 11th.